The Newly Renovated Hyatt Regency Tulsa is a luxury, high-rise hotel in the heart of Tulsa's vibrant downtown providing over 30 food and entertainment venues within a safe and walkable distance. 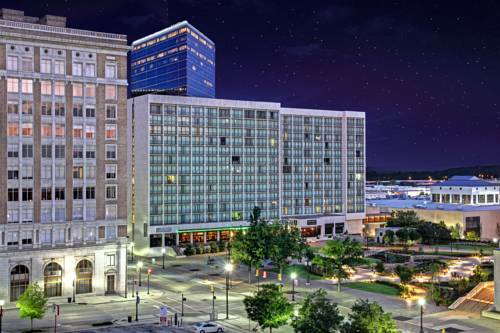 Our hotel delivers a rejuvenated mix of urban hospitality and Southwestern personality but best of all is adjacent to the famous Tulsa Performing Arts Center and just a few walking blocks from the Tulsa Convention Center. From small intimate gatherings to large meetings we can accommodate them all within our 455 guest rooms and 38,000 square feet of flexible function space. Whether you are traveling for business or pleasure, out stylish, contemporary hotel offers refreshing features and services such as, onsite restaurant and lounge, spa, indoor/outdoor pool and sun deck, state of the art fitness center, complimentary airport transportation to name a few, that create an unforgettable lodging experience in beautiful Tulsa, Oklahoma. Location Description ??? The Newly Renovated Hyatt Regency Tulsa is conveniently located in the heart of Tulsa's vibrant business, entertainment and cultural district. Hotel is only 8 miles from Tulsa International Airport. Williams Tower is adjoined via sky bridge to hotel and adjacent to the famous Tulsa Performing Arts Center. We are within walking distance of the Tulsa Convention Center and Oklahoma Jazz Hall of Fame. The Newly Renovated Hyatt Regency Tulsa is conveniently located in the heart of Tulsa's vibrant business, entertainment and cultural district. Hotel is only 8 miles from Tulsa International Airport. Williams Tower is adjoined via sky bridge to the hotel. Within walking distance to the BOK center, Tulsa Performing Arts Center and over 50 restaurants & Bars. BOK Tower is connected to the hotel. Patience. Come here in 2048 and maybe get your hands on that Plymouth Prowler. < 1 mile from Tulsa.